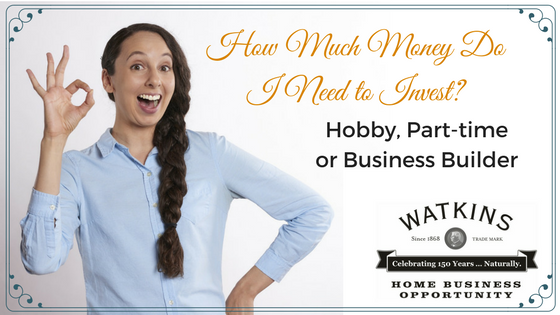 I’m often asked, how much money do I need to invest to start a Watkins business? The minimum investment is the cost of your membership which is only $29.95. Watkins doesn’t require Consultants to purchase any inventory. However, it depends on several things such as your goals and your budget and marketing strategy. Are you a planning to be a hobbyist? Will you join for a part-time career, or are you serious about building a real business? Every business requires some sort of investment and starting a Watkins home business is no different. With Watkins, the money you invest isn’t as important as the time and effort you invest. Following are some examples of three investment levels to start a Watkins home business. Our hobbyists join Watkins to maximize their value, they purchase their own products at a discount and sell to a few friends and family. They market one-to-one, by showing a catalog and/or flyer to friends and posting occasionally on social media. Besides your $29.95 membership plan on investing about $15.00 in a few items such as catalogs and an order book is essential. Adding an extra item to your orders that you or your friends use when it is on special is a smart strategy for saving money and time, and for providing great service to your friends. Our part-time Watkins Consultants work on average less than 10 hours per week. They start by introducing Watkins products to their warm market; friends, family, and acquaintances. They are growing their customer list and have a marketing strategy they use consistently such as party plan or vendor events. Besides your $29.95 membership plan on investing $150.00 to $200.00 in products and business materials. This will provide you with a nice display to get started and includes catalogs and customer order forms. Our Watkins Consultants who are serious about building a business work at least 10 hours per week. They sell to their warm market (friends, family, acquaintances) and are actively growing their customer base and business leads outside of their warm market. They have a strong marketing strategy and tactics they use consistently such as party plan, social media or vendor events. Besides your $29.95 membership plan on investing at least $500 in products and business materials. This will provide you with a great display or items to sell and includes business materials such as catalogs and customer order forms. Some serious business builders sell $10,000 of Watkins products in a month but don’t worry, you won’t need that type of inventory investment to get started. How much money you need to invest to get started with Watkins is a personal decision based on your goals, budget and the marketing strategy you will use. I’ve seen serious business builders who only invested the cost of their membership, put serious effort into generating sales then invested their profit into their business. Many Consultants do not carry any inventory while others have a few of our most popular items and the products they use themselves. We recommend every Watkins Consultant use our products themselves so they are changing where they shop and investing in themselves. Using Watkins products enables you to experience and share what you like about Watkins products with others. What does the $29.95 membership include? How much do you need to sell to stay active? 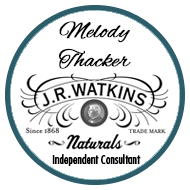 a discount on Watkins products orders of $150 or more. bonuses paid on Volume and Leadership when you qualify. access to online Business Support, Catalogs, Recipes, Reports and Ordering System. The opportunity to take advantage of incentives and recognition programs, including travel to exotic locations. Support by phone, text, email and Facebook messenger. There are no ordering requirement or quotas to stay active. Don’t hesitate to contact me if you have more questions.